Data is at the heart of every business. These days, most companies choose to store their data in a secure offsite facility. There are a number of reasons why this is the smartest choice for the majority of businesses. Servers and other critical pieces of technological infrastructure require certain things that are not available in typical business locations. This is particularly true if the company relies on making their data available online for customer use. With more and more businesses relying on the Internet to connect with clients, choosing the best secure data centre is a critical decision that can have a major impact on profits. Choosing a data centre generally begins by agreeing on a service level agreement. This is a legal document that outlines what a data centre is responsible for in securing and managing business information. An SLA should detail every service that a data centre will provide, and it is important to make sure that everything is spelled out clearly to avoid potential trouble in the future. A quality data centre will offer a variety of services that free clients from complicated IT-related tasks and let them focus on their core business. These companies employ technicians that save businesses from having to hire a full time network administrator to make sure that everything is running smoothly. They also ensure that servers never go down during power failures by utilizing redundant supplies from multiple power companies. Data centers will even have generators available in case a major disaster disrupts the power supply in an entire area. Quality data centers will also have staff on hand all the time to deal with any problems that may arise. Even if something goes wrong in the middle of the night, over the weekend or during a holiday, technicians will be there to fix the issue right away. All it takes is a phone call, and trained professionals will be able to deal with anything that may arise. They will also provide detailed reports to show companies what is going on with their technology infrastructure. 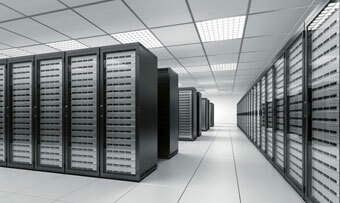 Most importantly, data centers offer redundancy in a number of different areas. Computer equipment does fail from time to time for many reasons. A quality data centre will have the technology in place to seamlessly transition to a backup system if something goes wrong. With this, customers will be able to access company data all of the time. In addition, they provide redundant Internet in case something happens with the main data connection. In short, a good data centre will provide a truly professional data hosting environment that businesses can rely on. Data centers also offer a number of options to ensure that business data is secure. The vast majority of these facilities will offer firewall protection to prevent intrusion from hackers and others who want to exploit a company’s information. In addition, they usually provide physical security measures that add an extra layer of protection. This includes renting out cages that servers can be stored in to prevent people from even touching servers and other data storage and processing devices. However, this is not always foolproof. Businesses that are seriously concerned about protecting the security of their mission critical data can choose to house their information infrastructure in government data centers. These allow the ultimate level of protection against any kind of intrusion.